Hosley's Inscribo Vase, 32" Silver. Like lines raked in the sand, the Inscribo collection are inscribed with textured horizontal lines that contrast with the smooth surface of the imposing floor vases. Designed exclusively for Hosley by Zoe Garred. 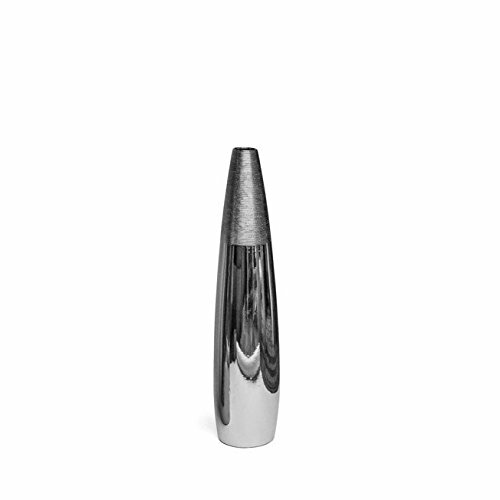 PRODUCT: Hosley's Inscribo Vase, 32" High, Silver. USES: These are just the right use for dry floral or greenery arrangements, as a decor next to fireplaces and as a planter, for both fresh flowers or plants (must use protective liner if used). They are just the right gift for a wedding or special occasion. BENEFITS: Like lines raked in the sand, the Inscribo collection are inscribed with textured horizontal lines that contrast with the smooth surface of the vase. MEASUREMENTS/MATERIAL: Each one measures 32" high and made of ceramic.